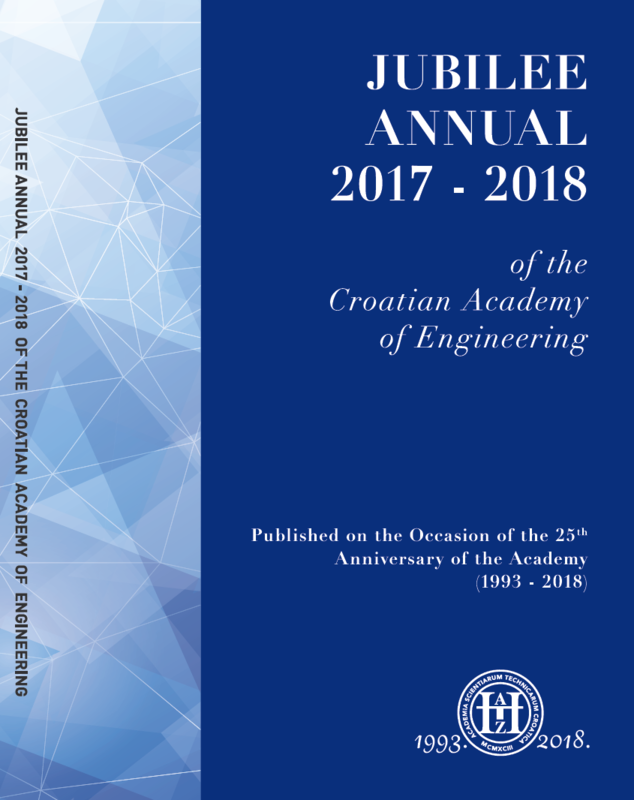 Organization of the Croatian Academy of Engineering, Rogale, D.
Normative Acts of the Academy, Gaurina-Međimurec, N.
Croatian Academy of Engineering 2003 – 2009, Kniewald, Z.
Croatian Academy of Engineering 2009 – 2013, Tonković, S.
Croatian Academy of Engineering 2013-2018, Andročec, V.
International Cooperation of the Croatian Academy of Engineering in the Period 1997-2018, Terze, Z., Kniewald†, J., Medved, V.
National Awards and Decorations of the Members of the Croatian Academy of Engineering from 1993 to 2017, Strika, M.
Members of the Academy in 2018, Strika, M.
Full Members of the Academy, Emeriti of the Academy and Associates of the Academy, Strika, M.
International Members of the Academy, Strika, M.
Honorary Members of the Academy, Strika, M.
Supporting Members of the Academy as stated by April 2018, Strika, M.
Deceased Members of the Croatian Academy of Engineering (1993 – 2018), Strika, M.
A Short Overview of the Programme of Work of the Governing Board of the Croatian Academy of Engineering 2017-2021, Gaurina-Međimurec, N.
A Comparison between a Stationary and a Semi-Mobile Plant for Wet Processing of Crushed Stone, Bedeković, G., Vrkljan, D.
Nanotechnology Applied to Create a New Generation of Multifunctional Construction Materials, Bjegović, D., Serdar, M., Štirmer, N.
Material Recovering from Offset Prints on Paper with Alternative Fibers, Bolanča, Z., Medek, G., Bolanča Mirković, I.
Computer-Supported 3D Kinematic Patterns Capture and Analysis in Handball, Gruić, I., Medved, V.
Weathering Resistance of Modified Wood – A Review, Jirouš-Rajković, V., Miklečić, J.
Subcritical Water Extraction Laboratory Plant Design and Application, Jokić, S., Aladić, K., Šubarić, D.
Urban Mining – a New Concept, Kovačević Zelić, B., Bedeković, G., Gradiški, K., Vučenović, H.
of Early Cortical Response, Krbot Skoric, M., Koris, I., Isgum, V., Jerbić, A. B., Cifrek, M.
Data Science for Genome Based Optimization in Agriculture: EU Research Data Alliance and Biopotential of Croatia Cultivars, Kurtanjek, Ž. Numerical Analysis of Heterogeneous Engineering Materials, Lesičar, T., Sorić, J., Tonković, Z.
Scour around the Circular and Square Profile Piers, Lončar, G., Andročec, V., Klapčić, S., Mišura, I. Investigation of the Impact of the Type of Weave on Shear Properties of Woven Fabrics in Various Directions, Penava, Ž., Šimić Penava, D., Knezić, Ž. Determination of Wind Loading Patterns and Structural Response of Constructions in Coastal Area of Croatia – Field Full-Scale Experiment, Peroš, B., Divić, V.
Surface Deformation Monitoring in the Republic of Croatia with MT-InSAR, Pribičević, B., Govorčin, M., Đapo, A.
Liquid-Liquid Equilibria in Two Systems Comprising Propionic Acid, Water and Organic Solvent, Rogošić, M., Dimić, L., Veljačić, L.
Determining and Analyzing the Quality of GNSS RTK Positioning, Zrinjski, M., Barković, Đ., Radočaj, D., Tupek, A. Who is Who in the Croatian Academy of Engineering, Rogale, D.